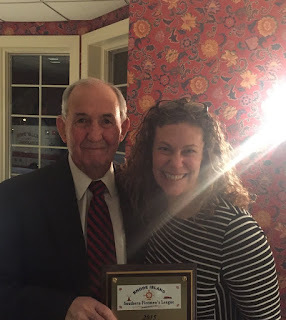 Rep. Tanzi with League President, Chief Frederick Stanley, Ret. 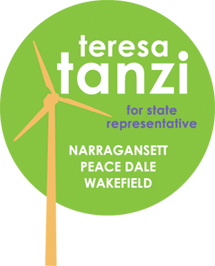 STATE HOUSE – The Rhode Island Southern Firemen’s League this week honored Rep. Teresa Tanzi as its 2015 Legislator of the Year. The organization, which represents 18 volunteer fire districts, emergency medical technician departments and several volunteer fire associations in Washington County and parts of Kent County, selected Representative Tanzi for her steadfast advocacy on behalf of volunteer fire districts during the 2015 legislative session, when troubles with the Central Coventry Fire District led to legislation that would have affected all volunteer districts. As a member of the House Finance Committee, where the bills were heard, she worked to defend volunteer fire districts, which she said provide excellent service and value to her district and towns all over the state. “Volunteer fire districts provide essential, lifesaving services to citizens, saving our towns and our taxpayers a significant amount of money. These extraordinarily dedicated men and women have always been vital to our community, providing not only firefighting and emergency response services, but also serving as a way for neighbors to help neighbors and make the connections that make life in small towns special. I’m very grateful to the women and men of the Rhode Island Southern Firemen’s League for all they provide to our area,” said Representative Tanzi (D-Dist. 34, South Kingstown, Narragansett). Representative Tanzi received the award Monday at the organization’s annual legislators’ night at the Richmond Country Club.